THIS IS A REAL "1 BEDROOM OCEAN VIEW & KITCHEN". LISTED AS A "1 BEDROOM SUITE WITH A FULL KITCHEN AND PRIVATE LANAI FEATURING FULL OCEAN VIEWS" ON THE AQUA PACIFIC MONARCH WEB SITE. THIS IS NOT A "STUDIO" UNIT. COMPARE WITH OTHER TYPES OF CONDOS WITHIN THE PACIFIC MONARCH. WANT A NICE PLACE TO STAY? My 1 Bedroom Condo is almost twice the size of the Studio Units. Pacific Monarch: This condominium complex is located in Central Waikiki at 2427 Kuhio Ave. The cross street is Uluniu. The central location allows easy access to the beach, restaurants, stores & tourist shops. You are not located on the Canal side or at the end of Waikiki. This provides great advantages for convenient access. The building is located on the ocean side of Kuhio Ave. next to the Hyatt Regency. The Condominium: The 1 bedroom 1 bath unit is on the 29th floor of a 33-story building. The bedroom is separated by solid walls and a door -- it is not walled off by a curtain. This is a corner unit, which faces towards the ocean. You are not located on the back (1 Bedroom) or side (Studio units) of the building. Wake up and enjoy views of the ocean and beach. The 29th floor allows unobstructed views of the city. At night the twinkling city lights are enjoyable to watch. Any room facing the ocean is also facing south and receives plenty of sunlight. Waikiki gets warm so all windows have the latest high tech tinting to reduce glare and heat (not found in many units) and the unit has air conditioning. Amenities: The unit sleeps 4 maximum. The bedroom has 1 king size bed. The sofa has a pullout double bed. There is 1 bathroom with a shower/bath. Linens and towels are provided. The kitchen is fully equipped with a refrigerator, stove, microwave, coffee maker, cooking utensils and dishes. There is Cable TV, a DVD and stereo system. All local calls are FREE. Internet: Wifi and cable Internet access is included. No Smoking: Smoking is not permitted. Lanai: There is a spacious open lanai with great ocean and city views. The lanai has a table and 4 chairs. I have a real lanai that you can go out on and enjoy. Most other lanai's in Waikiki are too small to actually go out and use. Pool/Spa: On the roof of the building is a heated pool and spa. There are magnificent views of Waikiki from the pool deck. At night the spa is a great place to relax and enjoy the night sky. The floor below has a sauna, showers, restrooms and party room with ice machine. Parking: Parking is available for $30 per 24 hour period. A ticket machine at the garage entrance accepts Credit Card or bills from $1 to $20. The parking garage is located on floors 2 to 5 of the Pacific Monarch building. There is unlimited in and out privileges. Laundry: A coin-operated laundry room is available on the 3rd floor. Bus: Bus transportation is very convenient. There is a bus stop right next to the Pacific Monarch. Buses come by every few minutes and can take you to most major places on Oahu. The bus is particularly convenient for transportation to the Ala Moana Shopping Center. Conveniences: Adjacent to or next to the Pacific Monarch are 2 Japanese restaurants, a convenience store, and 3 restaurants across the street. There is a Me's Barbecue restaurant, Hy's Steak House, the Coconut Café, Teppan Yaki restaurant and Iyasume Musubi Cafe. The Hyatt Regency is next door with its restaurants. Fast food restaurants are right around the corner (McDonald's, Burger King, KFC). Food Pantry (Grocery Store) is 2 blocks away. The Royal Hawaiian Shopping Center is 3 blocks away. Kapiolani Park is located at the end of Waikiki with its attractions including the Honolulu Zoo, Waikiki Aquarium, tennis courts and sports fields. A travel desk is located in the lobby for tours and local attractions. Beach: Waikiki beach is a “very short” walk. Just walk past the Hyatt Regency and you’re there! Compare: Compare the location of my unit within the Pacific Monarch to other advertised units. My unit has a great view and does not face into another building. I don't close the curtains on the photos that you see. Compare the location of the Pacific Monarch to others in Waikiki. The Pacific Monarch is in a very good location compared to most other condominium buildings. The walk to the beach is very short. Other buildings require a long 'city block' walk to get to the beach. Compare the conveniences of the Pacific Monarch to other condominium buildings. Restaurants & convenience stores are right there next to the Pacific Monarch. Available for $30 per 24 hour period with unlimited in and out privileges. All Parking is in hotel garage. We LOVE it!!! The place is very nice, comfortable and clean! We really enjoy the beautiful ocean view from the room and large balcony. There is a cute masubi cafe next to the lobby and also lots of closeby shops and restaurants. We are very pleased with the convenient location and ambience. We look forward to staying here again during our next Hawaii trip! Gary was very accommodating and got us checked in very early. The suite was lovely, a great location with an unbeatable view. When we return to Waikiki, we would definitely stay here again. We'd have given five stars except the views are badly blurred by the deteriorated anti-glare film on the windows and the sofa-bed couch is not comfortable to sitting. Great balcony. Very well equipped home away from home. Fantastic location and building. New window tinting that blocks >99% UV Rays and reduces heat build up by 64% has been installed. High exterior reflectivity provides near 100% daytime privacy. Crystal clear views look great! Sofa-bed cushions are medium firm. Gary is the BEST! Respectful and considerate. The condo is well maintained and appropriately furnished. Most of all, we felt very comfortable throughout our stay. The views from the lanai (balcony) were therapeutic and relaxing; (took many photos)... from waking up to a vast ocean, dining to a fiery sunset, and winding down to the glowing lights of the evening. We'd definitely come again. Mahalo Gary! We have just returned from spending 14 days in this 29th Floor 1 bedroom apartment. Stunning views every morning of the pacific ocean and waikikki. It was an easy 2/3 minute walk to the beach, shopping and restaurants. The apartment was neat clean and tidy and had everything in it that we required - microwave, large fridge, stove, oven. We had great views of the Hilton Hotel Fireworks lighting up the night sky even though we were about a mile away. We spent hours on the spacious lanai just enjoying the views and the sights and sounds of waikikki enjoying a nice glass of wine. Cable internet is provided but in the lobby you can access the free wifi. We have been to hawaii 5 times and this is by far the best accommodation we have stayed in. Would definitely stay again but this apartment is very popular and is basically booked out all year. 16 nights of fabulous vacation! 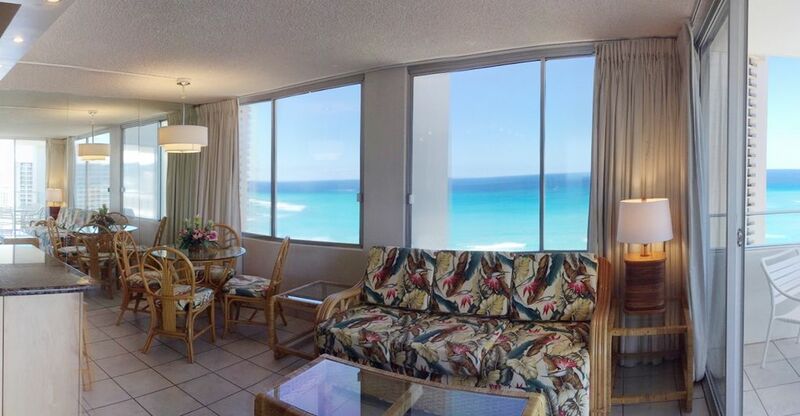 The Condo is so well situated, just a couple of minutes stroll to the beach. The views are hard to put into words but I would start with 'glorious'. The balcony (Lanai) is spacious and perfect to put your feet up and indulge in a cup of Kona coffee whilst taking in the multifaceted blue of the Pacific Ocean that changes daily before your eyes. You don't always find both beds in a Condo being comfortable, but the pull out Queen size sofa bed in the lounge is comfortable and fine to sleep on as well, which was a great bonus. There is everything you need in the kitchen and everything is lovely and clean and in great working order. I found the Condo quiet with minimal noise from other rooms. I would recommend this Condo for visitors who want a little home comfort and the freedom to cater for themselves if they wish. Gary is professional, courteous and great to deal with. I can see why people rebook! Mahalo Gary. Minimum stay is 6 nights for most dates. Minimum stay for certain dates is 5 nights.